Kenya's flag carrier, Kenya Airways, will soon launch flights between Jomo Kenyatta International Airport in Nairobi (Kenya) and Chileka International Airport in Blantyre (Malawi). The airline will operate 3 weekly flights between the two destinations from 02 August 2013. Kenya Airways received the approval from the Government of the Republic of Malawi to begin flying into Blantyre in late April 2013. The 5th Freedom Traffic Rights follows an Memorandum Of Understanding (MOU) signed between the Kenya and Malawi governments in 2008 which allows collaborative arrangements between designated carriers of both countries for their mutual benefit. Malawi has currently no national carrier so Kenya Airways will be the sole operator in the meantime. According to the latest statistics released by the Department of Environmental Affairs, South Africa has lost 367 rhinos to illegal poaching since the beginning of 2013. Of the rhinos poached, 247 rhinos were killed in the Kruger National Park, 35 in North West, 33 in KwaZulu-Natal, 28 in Limpopo, 23 in Mpumalanga and 1 in Gauteng. The number of people arrested in relation to rhino poaching now stands at 114. The majority of these (109) were alleged poachers, with 5 being couriers. CNN recently named their very own "World's 100 best beaches" and listed eight beaches in East and Southern Africa among those best beaches in the world. Three beaches in South Africa made it to the Top 100, as well as one beach in each Madagascar, Malawi, Mozambique, Kenya and Zanzibar. Get ready for some daydreaming! On Friday, 24 May 2013, Otto Whitehead and his friend Steve headed up Table Mountain to film the heavy fog over the Atlantic Seaboard rolling into Cape Town and Camps Bay. As the sun set and it cooled down, the fog rolled in under the full moon... Stunning! Kudos Otto for the video and Steve for the weather prediction! Enjoy! Cape Town - I love this city from Otto Whitehead on Vimeo. Ethiopia's flag carrier, Ethiopian Airlines, will launch new services to Sao Paulo and Rio de Janeiro in Brazil as of 01 July 2013. Flights to Brazil will be operated through the airline's second hub in Lomé, Togo, three times a week. The addition of Sao Paulo and Rio de Janeiro will bring the number of Ethiopian Airlines' international destinations across five continents to 74. The flights will be the only connection between West Africa and Brazil. Ethiopian Airlines and its partner airline in West Africa, ASKY Airlines, will be coordinating their schedules to give short, seamless and convenient connections to West Africa passengers travelling to and from Brazil. Passengers to and from Sao Paulo and Rio de Janeiro will be able to get convenient connections to destinations in Ethiopian Airlines' route network such as Lomé (Togo), Kinshasa (DR Congo), Kigali (Rwanda), Maputo (Mozambique), Abidjan (Senegal), Nairobi (Kenya), Lagos (Nigeria) and Dar es Salaam (Tanzania). South Africa's flag carrier, South African Airways, will codeshare on Air New Zealand's flights between Christchurch (New Zealand) and Perth (Australia) from December 2013. The codeshare flight will connect with South African Airways' Perth <> Johannesburg service, so that travellers from New Zealand can reach South Africa in just one stop. Depending on demand, the twice weekly flights will run from early December 2013 until at least April 2014. Good news for travellers in Tanzania. African low-cost airline Fastjet will resume flights between Kilimanjaro International Airport (JRO) and Abeid Amani Karume International Airport (ZNZ) on Zanzibar after a 10 week service suspension. From 02 July 2013 the airline will operate three weekly flights between the two destinations. According to the latest statistics released by the Department of Environmental Affairs, South Africa has lost 350 rhinos to illegal poaching since the beginning of 2013. Of the rhinos poached, 242 rhinos were killed in the Kruger National Park, 33 in KwaZulu-Natal, 29 in North West, 28 in Limpopo and 17 in Mpumalanga. The number of people arrested in relation to rhino poaching has risen from 98 to 106. The majority of these, 101, were at the level of poacher, with the rest being receivers. 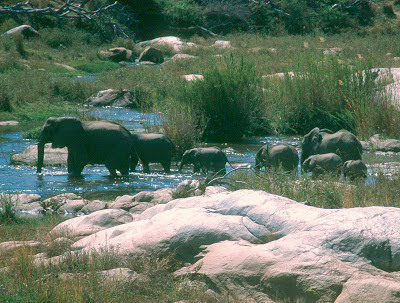 Four artificial water holes in the Kruger National Park will be demolished to prevent ecological problems, South African National Parks (SANParks) announced yesterday (22 May 2013). The demolition will take place in the week of 27 - 31 May 2013. The area around the four water holes will be cleared to ensure animals and human beings are safe; all roads in the areas will also be temporarily closed. Nhlotini – located on the S21 tourist road (Nwatimhiri road from Renosterkoppies to the Skukuza - Lower Sabie tar road). According to SANParks, artificial water holes where water did not previously occur have led to numerous ecological problems such as erosion and other environmental degradation. This also resulted in a negative consequence for the rare herbivore species such as roan and sable antelope, increasing grazing competition by the more abundant herbivores. The demolished water holes will be replaced by naturally occurring water holes in the area, where possible and where negative ecological consequences are not likely. The park had been closing artificial water points for the past six years, with the last closures having taken place near Mopani Rest Camp in October 2012. Directional signage and additional manpower will be in place at King Shaka International Airport to direct the public to the designated parking area within the Multi-Story Parking (MSP) park. Video: Atlantic Point Backpackers shows off Cape Town! The three owners of Atlantic Point Backpackers, situated in Green Point (Cape Town) and winner of the HostelBookers Award for Excellence 2013 - Best in Africa for Atmosphere, have made an awesome video showing you around Cape Town. If you are planning to visit and stay in the Mother Coty, definitely check it out and get to know the Cape Town from a locals point of view! Atlantic Point Backpackers, shows off Cape Town from tim on Vimeo. Atlantic Point Backpackers can accommodate 47 guests in private rooms and dorms, some of which are en-suite and have their own entrances for extra privacy and convenience. Each room is equipped with reading lights, heaters, ceiling fan and private lockers. The hostel is located 750m from the Green Point Stadium and approx. 1km from the V&A Waterfront. Enjoy Cape Town and, of course, Atlantic Point Backpackers! Kudos! Great news for all South Koreans. Ethiopia's flag carrier, Ethiopian Airlines, will commence flights between Addis Ababa and Incheon International Airport in Seoul, South Korea. From 18 June 2013 the airline will offer four weekly flights between the two destinations. With this new flight, Seoul will be connected to dozens of cities in Africa via Ethiopian Airlines' main hub at Addis Ababa Bole International Airport in Addis Ababa. Convenient connections will be available to and from major African cities such as Johannesburg (South Africa), Nairobi (Kenya), Dar Es Salaam (Tanzania), Lagos (Nigeria) and Accra (Ghana). Seoul will be Ethiopian Airlines' 73rd international destination. update (21 June 2013): According to Hans from come-along.nl (update: Tourbrief now also reporting it), Khaudum National Park is open and its two campsites can be used on a first-come, first-serve basis. We highly recommend to contact Namibia Tourism or Namibia's Ministry of Environment and Tourism before visiting the National Park to confirm the information given. According to Tourbrief, a Namibian tourism news website, both Khaudum Camp and Sigaretti Camp in the Khaudum National Park in Namibia are closed till further notice. As a result the National Park is currently also closed to the public. UPDATE: Khaudum National Park can still be done as a day visit, but is not recommended as the terrain is extremely difficult. The company which had the concession to develop the two camps within the National Park has chosen not to pursue it. The Khaudum National Park is located in the Kalahari desert in Namibia’s north-eastern Kavango Region. The remote National Park has a size of 3 842 km², of which only the border with Botswana and a 55-km section of the western border of the park are fenced. Khaudum is home to large herds of elephants and the African wild dog, the continent's most endangered large predator, as well as to over 320 species of birds. Khaudum Nature Reserve was proclaimed in 1989. In February 2007, the reserve was given National Park status. Free digital magazine: "Destination Mozambique 2013"
The Mozambique Tourism Authority recently published the 2013 edition of "Destination Mozambique", a 60-page digital magazine about travelling in Mozambique. The range of topics in the magazine covers Mozambican art, culture and food, as well as insider tips for travellers in the country, Maputo travel tips and hotel listings. Enjoy Mozambique! Free digital magazine: "This is Botswana 2013/14"
The Hospitality and Tourism Association of Botswana (HATAB), a privately established and funded umbrella organization representing all sectors of the tourism industry in Botswana, recently published the 2013/14 issue of its annual "This is Botswana" travel publication. The magazine contains information about mobile safaris in Botswana, the country's National Parks, shopping, airlines, accommodation establishments and much more. Enjoy the mag and, of course, Botswana! The Whalesong Lodge, a small intimate guesthouse perched on top of the rugged De Kelders Cliffs overlooking the picturesque Walker Bay, recently got certified by Fair Trade Tourism (FTT). The lodge offers five spacious bedrooms with en-suite bathrooms, a comfortable open-plan lounge and dining room, as well as a wooden deck and a small swimming pool. The Whalesong Lodge uses ecologically sustainable and environmentally friendly cleaning products. The products are carefully chosen and a conscious effort is made re-use and recycle wherever possible, as well as to reduce the use of disposable and consumable goods (e.g. buying items in bulk and storing food in glass containers, while recycling all packaging, etc). Guests at Whalesong Lodge are informed about the lodge operator's green initiatives and activities in the service directory (e.g. recycling, composting, involvement in Trees for Tourism, support of sustainable food supplies, etc). The Fair Trade Tourism (FTT) certification is an independent endorsement of fair and responsible tourism practices by tourism establishments in South Africa. It is based on adherence to specific criteria including fair wages and working conditions, fair distribution of benefits, ethical business practice, and respect for human rights, culture and the environment. Certification is offered on a voluntary basis to providers of tourist accommodation, activities and attractions. Brandberg Mountain (Namibia): Hiking permit required! Hiking permits will cost N$350/day (international visitors) or N$250/day (Namibian citizens). An official permission is also required for filming and photography undertakings for commercial purposes or research. Travellers who wish to take a tour to the White Lady rock paintings, located close to the road from Khorixas to Hentie's Bay, will be assisted by the staff at the office situated at the site and are therefore not required to seek written permission. The hike to the White Lady rock paintings takes about 60 min over rough terrain, along the (usually dry) Tsisab Gorge. WildEarth's live game drives return at Thornybush Private Game Reserve, a 11,500 hectares game reserve adjacent to the Kruger National Park in South Africa. From Thursday, 16 May 2013 at 06:30 Central African Time (04:30 UTC) the Thornybush/WildEarth crew will take you on two live game drives per day to discover the many wonders the Thornybush Private Game Reserve has to offer. The drive times will be daily between 06:30 - 09:30 CAT and 15:00 - 17:30 CAT. For more info and the live video footage, click here! According to the latest statistics released by the Department of Environmental Affairs, South Africa has lost 313 rhinos to illegal poaching since the beginning of 2013. Of the rhinos poached, 229 rhinos were killed in the Kruger National Park, 25 in North West, 24 in Limpopo, 20 in KwaZulu-Natal and 15 in Mpumalanga. A total of 98 people (Kruger: 48, Gauteng: 3, Mpumalanga: 6, Limpopo: 20, North West: 8, KZN: 13) have been arrested since the beginning of the year for rhino poaching and related activities. SafariNow.com, Africa's largest booking website, is offering its customers to enjoy their next holiday adventure for free. All you need to do is book your holiday accommodation through SafariNow.com during the month of May 2013 and you’ll stand a chance to win an accommodation voucher to the value of your last booking made through SafariNow.com. To be eligible to win, you are also required to like or follow SafariNow.com on one of their social networks, which include Facebook, Twitter or Google+. One winner will be drawn every Friday starting 13 May 2013. The last draw day will be made on Friday 31 May 2013. Good luck! Click here for more info about the competiton as well as the T&C! The Department of Immigration in Zambia is going to computerise its border posts at Victoria Falls/Livingstone (Zambia/Zimbabwe), Katima Mulilo (Zambia/Namibia) and Kazungula (Zambia/Botswana) by June 2013 to ease the movement of travellers to and from Zambia. According to the public relations officer of the Department of Immigration, Mubanda Chansa, twenty computers, fifteen webcams, fifteen finger print scanners and nine printers were bought so far to equip the three border posts and Zamtel was contracted to connect the borders with the Department's headquarters in Lusaka. Immigration officers at the soon-to-be computerised border controls will also get a special training on how to use the new system. South Africa's Cape West Coast stretches over 400 km along the country's coastline and covers six different regions, namely Swartland (Darling), Peninsula (Langebaan), Bergrivier (Velddrif), Cederberg (Lamberts Bay, Wupperthal), Matzikama (Strandfontein) and the Hardeveld (Bitterfontein). The Cape West Coast is a region of contrast and beauty, which is offering the visitor all kinds of tourist highlights. The seafood lover will find some of the best fish and crayfish South Africa has, the sports enthusiast will be busy exploring the various hiking trails and mountain bike routes, while other will be exploring the Langebaan Lagoon on their kiteboards, surfboards or waterskies. If you like birding, Lamberts Bay and its Bird Island Nature Reserve will be your hotspot along the coast. If you want to know more about South Africa's Cape West Coast, watch the video below! Enjoy and safe travels! South Africa's Namaqualand lies within the Namakwa District Municipality and forms part of Northern Cape Province. Don't miss it between early August and late September for the annual flower season! btw - if you need new shoes, make your way to Wupperthal in the Cederberg mountains and get some handsewn veldskoen (traditional soft suede shoes) in the historic shoe factory, founded by 1836 by Johann Gottlieb Leipoldt, grandfather of the famous South African poet C. Louis Leipoldt. Tanzania National Parks (TANAPA), the public organisation with the mandate of managing all areas designated as national parks in Tanzania, has revised tariffs across fifteen Tanzanian National Parks, such as Serengeti National Park and Tarangire National Park. The new increased rates cover not only the regular park entrance fees for Non East African citizens (USD$) and East Africa citizens (TSHS), but also a range of other services such as professional filming fees and fees for walking safaris, night game drives, canoeing, among others. TANAPA also renamed the park entry fee to "conservation fee". The new tariffs will be effective from 01 July 2013 until 30 June 2015.
continued to escalate hence increasing operational costs for the organization. Improve tourism facilities and infrastructure such as roads, bridges and airstrips, to cater for increased number of visitors and diversify tourism activities in order to provide outstanding visitor experience. Improvement of staff incentives and packages to cope with increased cost of living. update (09 July 2013): According to to a tweet from Wesgro, the geocaching tour will be launched in mid August 2013 in all 6 regions of the Western Cape. Wesgro, the official Desitnation Marketing, Investment and Trade Promotion Agency for the Western Cape, will soon launch Africa’s first officially branded geocaching tour and competition. According to Nils Flaatten, CEO of Wesgro, the geocaching tour will be developed in partnership with official geocaching site, geocaching.com, and will include 16 caches hidden in different locations in Cape Town, the Winelands, the Karoo, West Coast, Overberg, the Garden Route and the Klein Karoo. Awesome! For more info, especially about the geocaching competition, listen to the interview with Nils Flaatten below! The Kungwini Guest House in Bronkhorstspruit (Gauteng) is the fourth tourism business in the Dinokeng area to become certified by the Fair Trade Tourism (FTT). The Guest House is located in close proximity to Bronkhorstspruit Dam, Rietvlei Nature Reserve and the Nan Hua Buddhist temple & seminary. The Kungwini Guest House, just 45 minutes away from OR Tambo International Airport in Johannesburg, offers en-suite rooms with a patio overlooking its beautiful garden, an aiport shuttle service, laundry facilities as well as braai/bbq facilties and a fireplace. Kungwini Guest House supports community development projects on an on-going basis and believes in youth development. It provides hospitality training for interns selected from the community and further supports the youth in sports and events that appeal to both the community and tourists. The Fair Trade Tourism (FTT) certification is an independent endorsement of fair and responsible tourism practice in South Africa. It is based on adherence to specific criteria including fair wages and working conditions, fair distribution of benefits, ethical business practice, and respect for human rights, culture and the environment. Certification is offered on a voluntary basis to providers of tourist accommodation, activities and attractions. The certification of the Kungwini Guest House is part of the Gauteng Tourism Authority (GTA) project "Travel with a Conscience", which is aimed at positioning Dinokeng as a responsible tourism destination. Dinokeng includes the three hubs of Dinokeng Game Reserve, Roodeplaat Dam and Cullinan.